Scroll page for "How-To Guide"
All EGO Batteries | Bottom Coils fit ProTanks and EVOD's. This page has tips and instructions for your new EGO H2 eCigs, including how to change the coil head, how to refill it with e-liquid and how to charge the eGo CE6 batteries. The EGO-H2 is very popular and one of the best EGO Series e-Cig designs avalable. It boasts a one-piece tube and tip, and a replaceable bottom coil just like in the ProTanks. The H2 tank and the tip are integrated into one easily replaceable clearomizer. The atomizing coils are located at the bottom of Clearomizer, resulting in better vaporizing effects of the e-liquid. All it's parts can be changed, and easily maintained by washing either the coils or Tub tank. Another great addition to teh eGO Series, this model works with any EGO Batteries. A coil that was not tightly secured to base can cause leaking and no contact to battery. The EGO-H2 coils should be replaced between 1-2 weeks, depending on frequency of use, to maintain a good vapor quality. An old coil will produce weak vapor, stop functioning, taste bad, or may cause leaking. After refilling the tank, always check the coil to make sure is secured tightly to the base. It's not uncommon for the coil to become loose after a couple refills. When removing any atomizer from a battery, it is common for e-Liquid to escape onto the battery. Use a paper towel or q-tip to clean the connections. 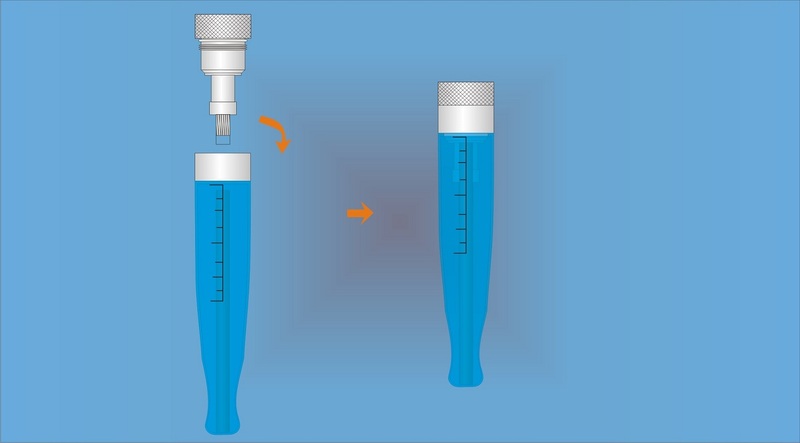 If the base is not secured to the tank, leakage can occur. Always secure the base finger tight. To prevent leaks and flooding, keep the tank full of liquid to help maintain the vaccum effect. The Tank and Tip are one piece and coils replaced easily. There's no drip tip and it doesn't leak when it's turned on its side or upside down. There is a milileter scale so you can determine how much nicotine intake you have taken. It's a Bottom Changeable Coil (BCC) so it heats from the bottom. With the atomizing coils located at the bottom it's much more efficient at vaporizing, there's no need to tip the Clearomizer on it's side if the liquid level is a bit low. The clearomizer is easily inspected and replaced if needed. Large vapor production with no burning taste or leakage. Looks sleek and elegant attached to a colored EGO Battery. * Tip: Loose coils may cause device to leak or not work at all. (4. ): Reattach the Base and Tube. 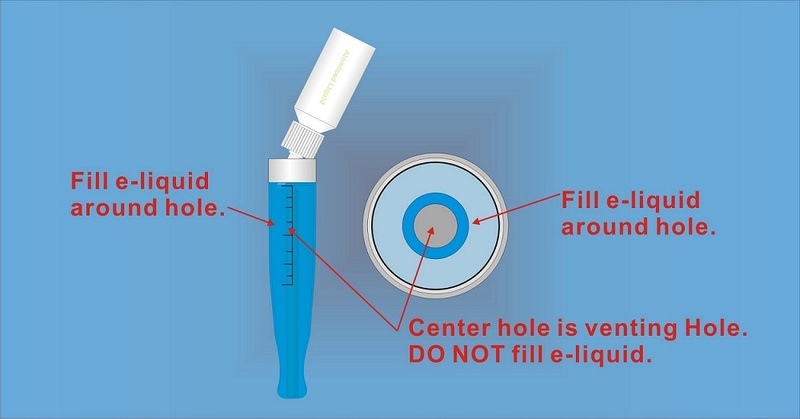 Step 1-2: Remove the lid from the e-juice bottle and with scissors, take off the tip to allow e-Liquid to pass. Step 3: Holde upside down, and unscrew the H2 base from Tube. 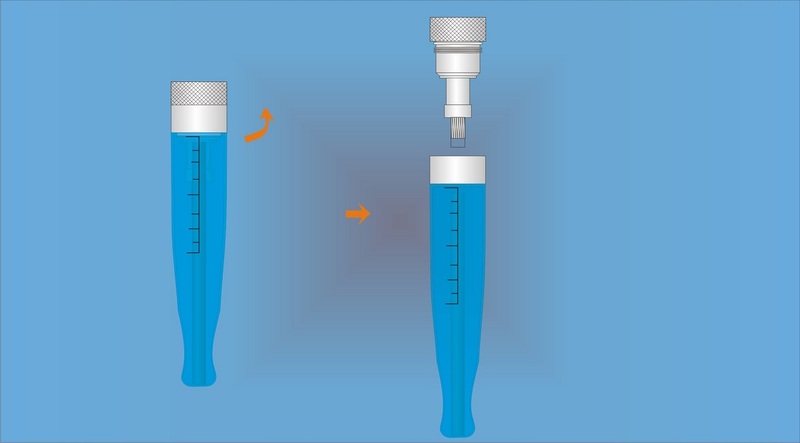 Step 4: Poor e-Liquid down the side on the inside of the EGO-H2 Clearomizer Tube and Tip . * Tip: Everytime you refill with e-Juice, give an extra tighten to the coil to make sure has not come loose. *Tip: Your EGO H2 eCig will only work when the button is pressed and user puffs simutaneously. Attach your EGO Battery to the Charger. Now plug into a Computer or any USB outlet. For first use, we recommend leaving the battery on the Charger for 8 hours, even after the light turns green. Use battery for 20 more minutes, then recharge again for 1 more hour. Your EGO battery is now ready for Vaping! For future use, regular charge time is 2-3 hours. The EGO-H2 electronic cigarette uses technology that is just like the ProTank models. However, this e-Cig model uses a polycarbonate tank as opposed to the Pyrex glass and hard metal. If you live in one of the colder climates, you will definitely appreciate the advantage of the plastic tip, as the metal tips tend to get very cold and may stick to your lips in temperatures less than -30°. Like the ProTank eCigs, the EGO-H2 uses bottom changeable coils (BCC). The Clearomizer tube and the tip are combined into a single transparent polycarbonate plastic tank. While the H2 electronic cigarette is not quite as durable as the Mini ProTank model, it is in fact a great device. Best of all, the parts are cheap and easy to replace. You also get to choose from nine exciting and fun colors, which includes stainless steel, blue, white, green, red, yellow, pink, purple and black. The EGO-H2 is aimed at those who may be new to vaping. The starter kit comes with one base, which can be used with any EGO series battery and requires a Bottom Changeable Coil head, tube and tip to work. You will also get one transparent Clearomizer polycarbonate tube, which will hold up to 1.6 milliliters of your favorite eLiquid. The Clearomizer tube come fully assembled in a variety of colors and uses bottom coils. This starter kit also includes five EGO bottom coils, which is a minimum 5 week supply. These coils are interchangeable with any of the bottom loading electronic cigarettes, such as the EGO-H2, Mini ProTank, ProTank, Fire-Fog, Smok-Tech, Kanger EVOD and ProTank-2 Glassomizer models. Your kit will also feature two EGO 650 mAh batteries. These are the standard EGO batteries, which are rechargeable lithium ion batteries. They feature rubber paint that is available in a variety of different colors. For the moderate electronic cigarette user, you can expect to get anywhere from four hours to six hours of battery life in between charges. In addition, this battery makes it possible to upgrade to any EGO electronic cigarette. The EGO-H2 electronic cigarette starter kit also features two great ways to keep your device charged and ready for use. The universal AC/USB adaptor can be used with a PCC, USB battery or USB charger and plugs direct into any electrical socket. In addition to charging your ecig, this adaptor can also be used with your cell phone, tablet, iPhone as well as any other device that can be charged with USB. You will also receive the EGO USB charger. This charger can be used with the 650mAh batteries that you get with the kit, but also can be used with the 1100mAh+ batteries. With the USB charger, your device will be fully charged and ready for use in as little as two to three hours. Finally, you will also receive on 10 milliliter bottle of eLiquid to go with your EGO-H2 Electronic Cigarette. Choose a fruity flavor like grape, peach or pineapple. Perhaps you prefer the more traditional flavors like menthol or tobacco. There are even a long list of exotic flavors you may want to try.